John Olney told me it all began with two brothers, Jeremiah & Dennis O’Donovan, who came to Liverpool from Dublin in the eighteen thirties at the time of the potato famine in Ireland. Dennis took a passage from Liverpool across the Atlantic to seek his fortune with the Hudson Bay Trading Company, while Jeremiah came to the East End and settled in Fireball Court, Aldgate. It sounds like an adventure story of long ago, yet John imbues it with a vivid present tense quality because Jeremiah was his great-great-grandfather and, to a degree, the nature of John’s own life has been the outcome of these events. 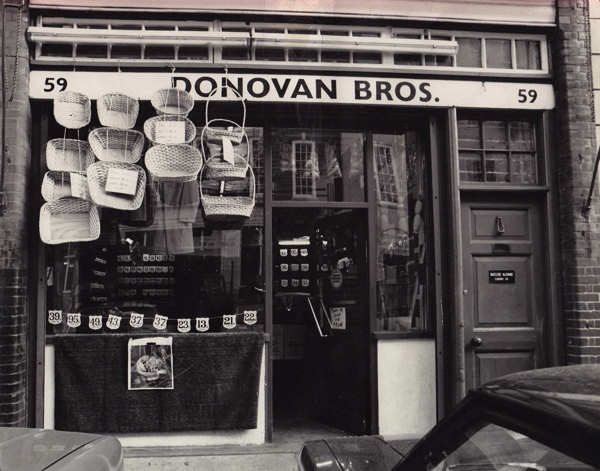 The brothers’ tale explains both how he came to be here and why Donovan Brothers continues today in the way it does as a family business. I was touched by John’s story because it was the first I have heard of the Irish in Spitalfields recounted to me by a descendant. Of the different waves of immigration that have passed through, the Irish are the least acknowledged and the people who have left the least evidence visible today. 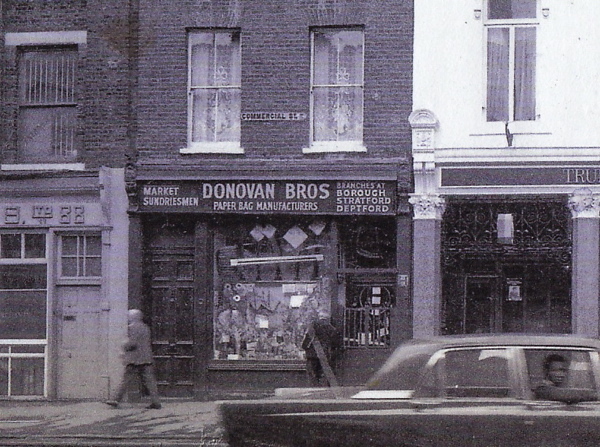 Yet anyone who walks through Spitalfields knows the building in Crispin St with the fine old signwriting that says “Donovan Brothers – The noted house for paper bags,” this was where the business began that John still runs today at the New Spitalfields Market in Leyton. John and I sat talking in the office of the Market Tenants’ Association in the grey light of early morning recently, watching as the wholesale fruit & vegetable market wound up for the night and the car park emptied out. There is an innate modesty to this gracious man with a strong physical presence and a discreet, withheld quality that colours the plain telling of his stories. You can tell from his glinting eyes that John’s family possesses an intensity of meaning for him, yet he adopts a quiet unemotional tone while speaking of it which serves to communicate a greater depth of feeling than any overt emotion. “So you’ve come to hear about the fields…” he said, thinking out loud. By “the fields” John meant Spitalfields, using a term of reference I had not heard before. In its archaic colloquial tone, it spoke eloquently of his relationship to the place where his family dwelled continuously from the eighteen thirties and where he began his lifelong involvement with markets. “My mother was a Donovan” declared John, outlining his precise connection to the line of descent, “She was one of eight, five boys and three daughters. We were a very close knit family, and it was so exciting for a boy of seven or eight, when I first entered the Spitalfields shop and sat on the counter. My uncle would sit outside with the chicken seller at the corner of Leyden St and reminisce about old times. It was history that was being spoken, you didn’t have to read it in books. My uncle used to end up at the bottom of Whites Row where there used to be a barbers and I would sit outside on the curb with my sweets – and that’s how it was in the old days. 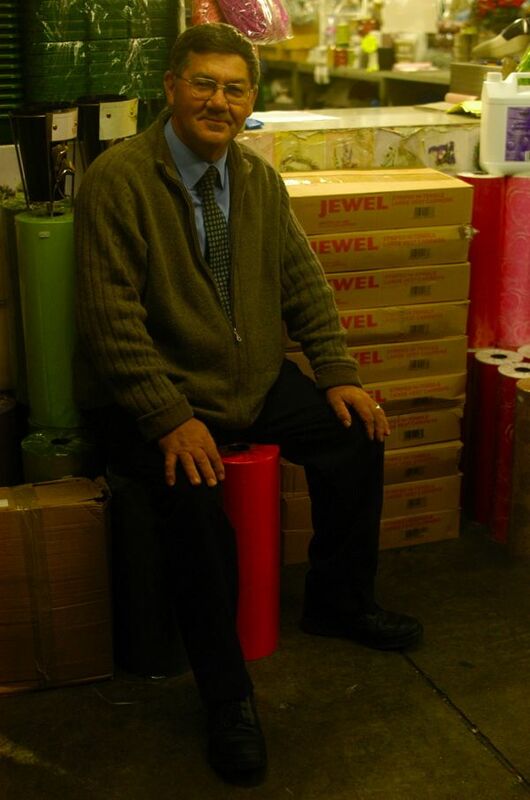 We ran it as a family business and if there was a problem we dealt with it at once between us. The eldest was my grandfather, the governor, and when he died my uncles took over. The governor tells you what to do but everyone else asks. To everyone that works for me today, I am the governor, but in the family my elderly uncles are still the governors. Like in all family businesses, you could count upon one another. There’s no one person shouldering all the problems at any one time. John’s two sons and daughter all work for Donovan Brothers now, ensuring the family business goes on for another generation. I think we may permit him to enjoy a certain swagger, coming in to work before dawn in all weathers and continuing his pattern of napping twice a day, at the end of the afternoon and in the late evening, thereby sustaining himself with superlative resilience through the extended antisocial hours that market life entails. The market is a world to itself and it is John Olney’s world. The building in Crispin St retains its signwriting today. In Commercial St, nineteen sixties. 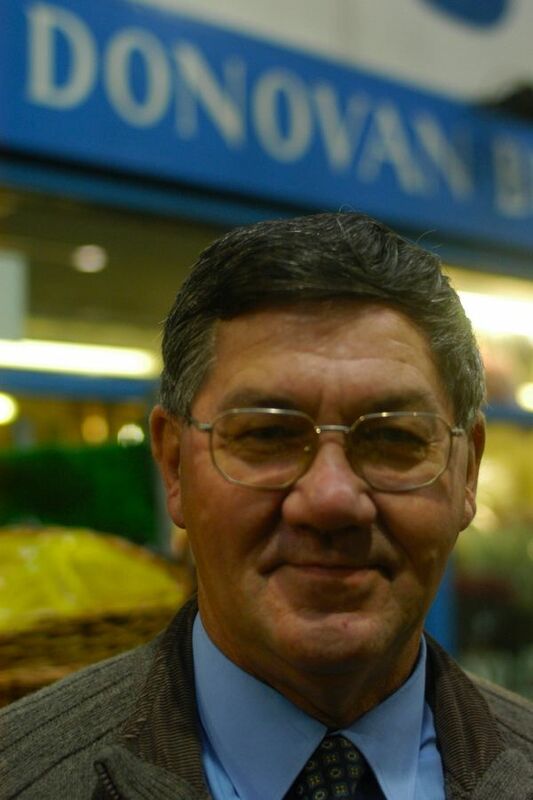 John Olney outside his shop in the New Spitalfields Market, Leyton. You may like to see Mark Jackson & Huw Davies’ photographs of the old Spitalfields Market. Is there a market for the product ? Can I get in to the wholesale market ? Would you be interested in Shifting the product ? Where did you find those archival photos of the old shopfronts? 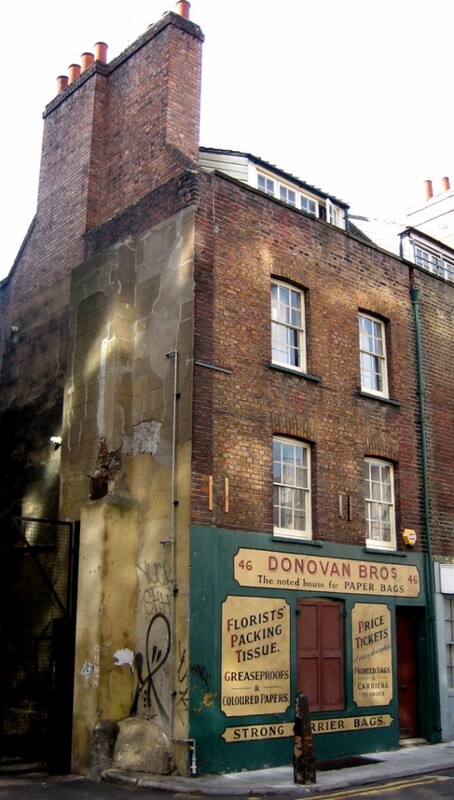 Would love to use one on a new ghostsigns tour that I’m developing which will pass the sign on Crispin Street.